Jaguar Land Rover, the iconic British automotive manufacturer, are renowned around the globe for their beautifully crafted vehicles and design heritage. Not only do they push the boundaries of design and technology, but they create a sense of theatre and emotional connection rarely seen in their competitors. With such strong design principles, and a host of successful cars vindicating them, it was clear that these same principles ought to translate seamlessly into the digital realm. This is something that we pride ourselves on at ustwo. With a clear overlap of values, we were really excited to form a partnership joining the quality of JLR’s automotive design with our knowledge of digital product design and development. The launch of the Apple Watch came with the potential, for the first time, to extend the connected car experience to the wrist. For us, however, it was essential that we didn’t deliver just a ‘bragging app’, but that we connected the customer and car in an elegant, practical and appropriate way. Automotive design and development is a notoriously long, painstaking process, but within a few months we were able to go from concept to high-fidelity prototype to a developed product, testing with users along the way and gaining key insights into what was working and what needed to change. Having the ability to start the car from the watch in a few short weeks was an exciting milestone that pushed us forward with real purpose. Whilst it would be easy to create a gimmicky bragging app, we wanted to create something that delivered a genuine contextual experience that users would find meaningful. With that in mind, and after some early testing, our strategy coalesced around delivering peace of mind. Did I lock my car? Will I have enough fuel for my journey? Is my alarm going off? These were all questions we wanted users to be able to answer with a glance at their wrist and also, most importantly, have the ability to act on. Bringing the experience of the physical product to the watch app was also an important part of the process. We also had to take into consideration how key attributes associated with the cars (luxury, clean lines, pure forms) might translate to the watch. 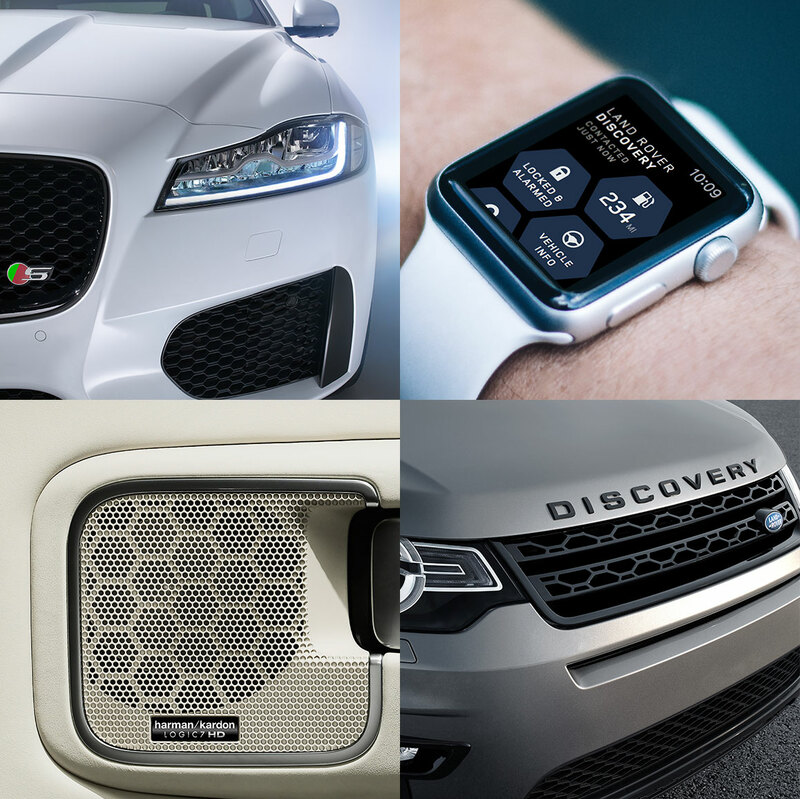 Using design language that is ubiquitous across both Land Rover and Jaguar was essential, and so the honeycomb structure of the grills was the foundations of the interface. 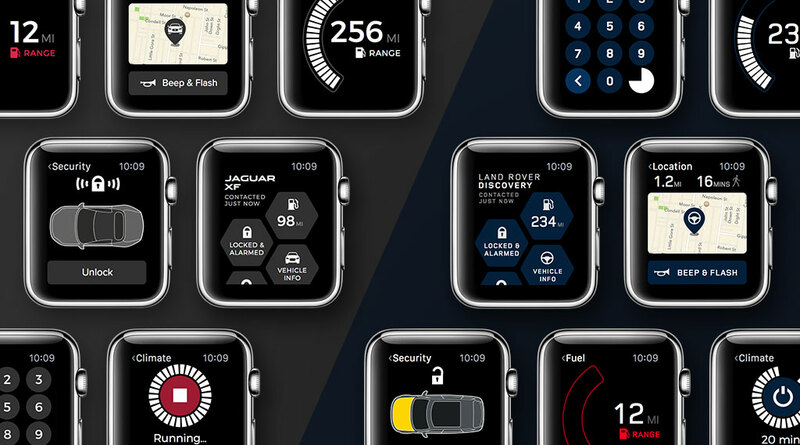 Using motion and visual touches, we’ve created an app that provides the sense of theatre and luxury that drivers of Jaguar and Land Rover come to expect from their vehicles – a truly consistent experience between the wrist and the cockpit of the vehicle. With a high profile launch at the Frankfurt Motor show in September, the entire team from both JLR and ustwo have been really enthusiastic to venture into a completely new product space. To be launching a product not only to one or two cars in the range, but the entire fleet, is a very exciting prospect for all involved. Realistically, we’re all expecting the product to evolve through time as we better understand how people will use the watch, but there’s a real sense of pride that in an industry that takes years to deliver products, we’ve taken something to market in just months.